I've popped into this pub on a number of occasions and always found the management and staff very friendly. 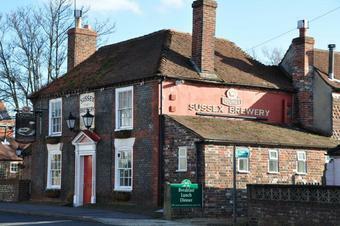 They serve a wide range of real ales including 1 or 2 racked behind the bar. Despite their annoying practice of spending 10 min's cleaning the pipe every time a barrel is changed, the beer is never that good. Maybe they should stock fewer beers and clean the pipes properly once a week! Gem of a pub in a small town unfortunately dominated by Fullers (who took over Gales), and Youngs pubs. Always a good range - usually Directors, Tribute, Youngs Special, Bombadier and more recently Summer Lightning - racked on the back wall. Good pub food, known for its sausages but spanning a wide range. Courtyard garden at the back is a real sun-trap. Fantastic find a real gem .. famous for sausages, great for real ales and a welcoming atmosphere. Went for a Sunday roast which they do all day (well until about 6pm I think) will definitely be going back again soon! Went here Saturday 12th March 2011 for a pre-booked celebration meal with a group of 15. Despite being a "speciality sausage" pub two of the speciality sausages, ordered at least a week previously , were not on the menu as their supplier had not delivered! Service, when it finally happened, was both slow and appalling with an interminable wait after the starter course. The food was lacklustre and in some cases would appear to have been sat on the hotplate for some time before being served lukewarm. Not a place I would consider going back to again.